Get training on how to accompany immigrants who have already been identified by ICE for possible deportation and have to appear in Immigration Court or to check-in with ICE. Take a Bus to the "No Muslim Ban Ever" Rally in D.C. The latest iteration of the Muslim ban goes into effect today. Many activist groups are heading to Washington, D.C., to protest. As of Sunday night, the Muslim Community Network still had several seats available on its two buses. The trip is free but you must reserve in advance here. For other bus possibilities, explore the organizers' Facebook page. United Here! Local 100 is the union for food service and restaurant workers in the New York/New Jersey area. Over 50% of Unite Here! contracts expire in 2018. The contracts protect workers from being discriminated against because of their race, gender identity and sexual orientation. They also protect people from being abused or threatened regardless of their immigration status. 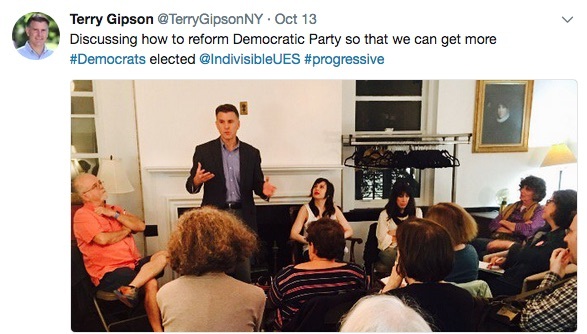 Terry Gipson is a former state senator and Democrat who is exploring a run for New York governor against Andrew Cuomo. He attended last week's Indivisible UES meeting and discussed, among other things, his goal of disbanding the IDC -- the group of eight state senators who run as Democrats but vote Republican, blocking progressive legislation from passing in New York State. Follow Gipson on Twitter and Facebook to learn more. UnLocal provides legal services to immigrants, refugees and asylum seekers. Now celebrating its fifth anniversary, UnLocal is more essential than ever. This fundraiser includes live musical performance and "off-the-beaten path cuisine made by refugees.